I think at this point I’ve exhausted my thesis about there being too much overhead supply across the stock market. But yesterday I was doing my weekly Dow 30 review, and I couldn’t help but notice how many examples I found where prices were now holding below a ton of former support, which of course, turns into overhead supply. The old saying is, “Don’t fight Papa Dow”, meaning that if you can take the weight-of-the-evidence you’re seeing from the Dow 30 stocks, you’re going to get a very good idea of which direction the major averages are headed. Say what you want about price-weighted indexes, but the correlations the Dow has with the other large-cap averages is through the roof. Whether you agree with how a price-weighted index is constructed or not, the Dow moves with the S&P500 and your other favorite cap-weighted indexes. So we like to track it because the fact that there are only 30 stocks in it makes it simple for us to do. 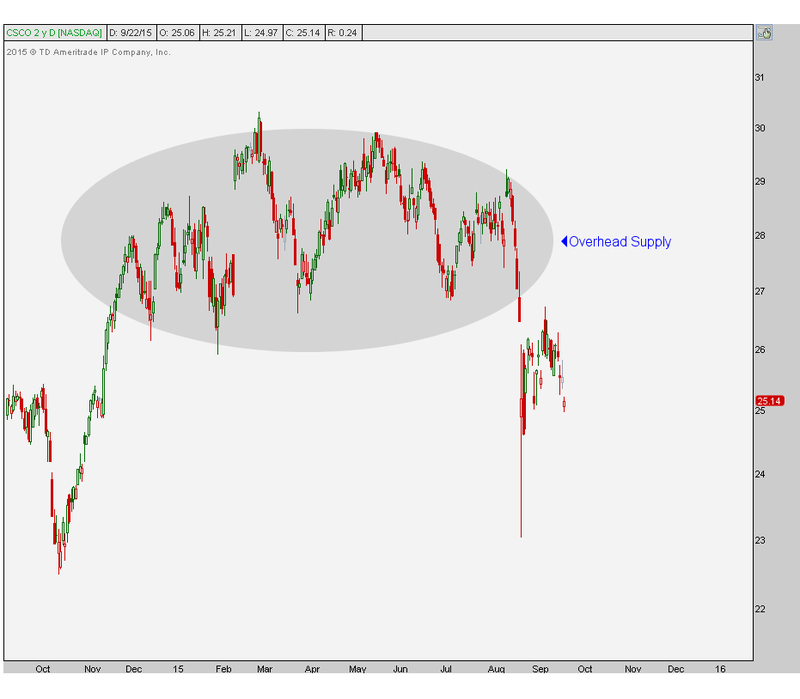 Here are a few examples of overhead supply throughout the Dow 30. All of these broken support levels become resistance on any rebounds. We’re talking about either the bag holders that didn’t sell when they had the opportunity or the ones who bought too late. The overhead supply consists of the excessively large, “just please get me back to break even” crowd that is sitting there waiting hoping for a bounce back in order to sell it to you. There are more examples but I think you get the point. 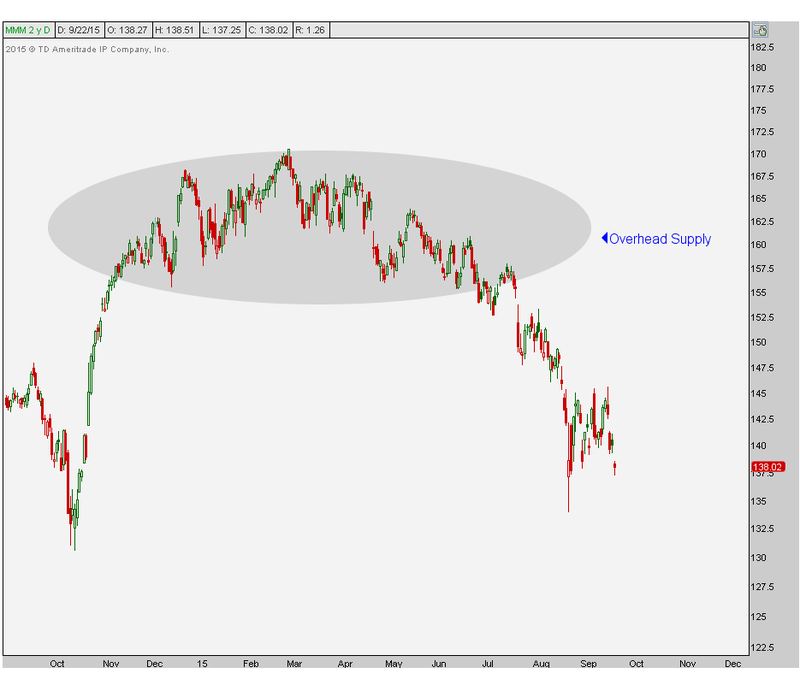 A lot of these stocks are stuck below a ton of overhead supply. It is very difficult for prices to just rip right through that without first absorbing all of that supply. At the very best it’s going to take some time. At the very worst, things will get uglier before they get better. 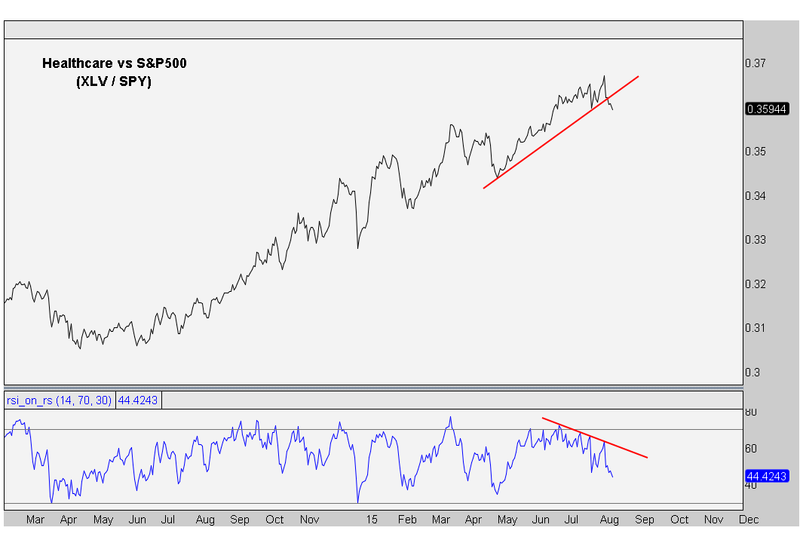 Either way, it is more of a sell strength environment than a buy weakness. That’s how I see it. This is a big theme right now and an ongoing problem. I don’t care about China or interest rates or whatever the “problem” du jeur is being advertised by the media. I’m worried about the overhead supply. If there are more sellers than buyers, it’s hard for prices to rise. That’s just supply and demand 101. We will keep reevaluating, but I don’t see this problem going away any time soon. 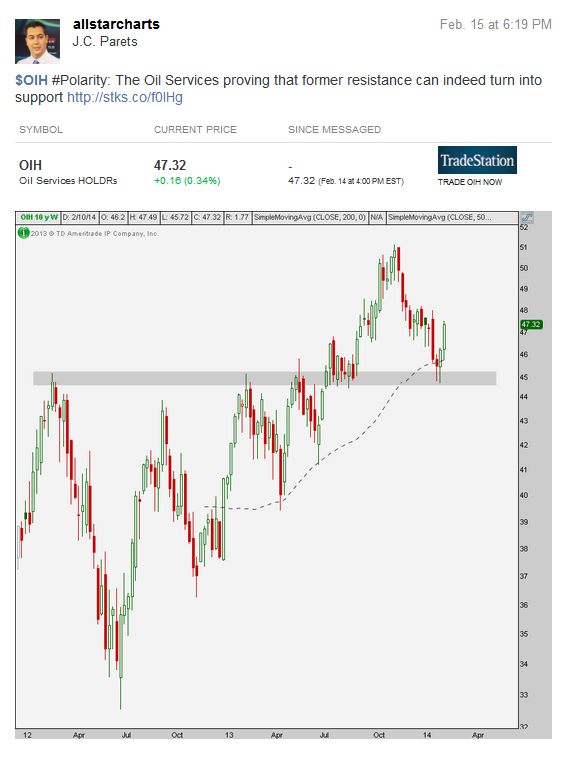 Click Here to receive weekly updates on each of these charts looking at both daily and weekly timeframes. These reports also include the rest of the Dow 30 components. Is Healthcare Due For A Collapse? Coming into 2015, Healthcare was one of the sectors that we wanted to focus on from the long side. 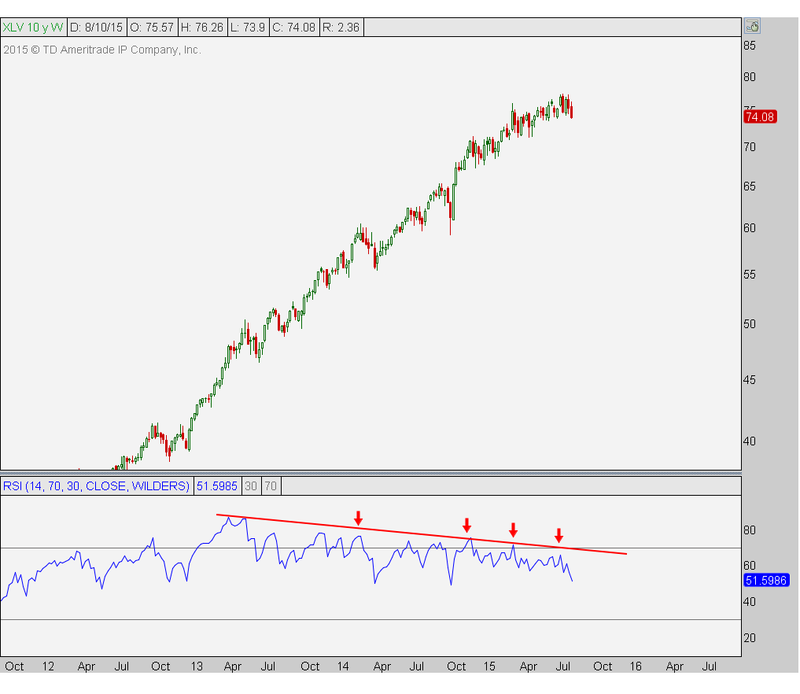 From a relative strength perspective, there was nothing out there that we could even compare it to. Healthcare was by far the strongest sector across U.S. markets. Our upside targets were hit on March 20th. I remember that day vividly because it was a Friday and our upside target in Russell2000 was hit on the exact same day. Once that upside objective was achieved, we saw no reason to be involved in this sector any longer. Fortunately we went no where over the next several months as the market, as usual, reacts and respects levels where Fibonacci and measured move targets cluster together. There is a reason why we watch these levels and set target prices. As far as relative strength goes, remember this was one of the reasons we liked it in the first place coming into 2015. 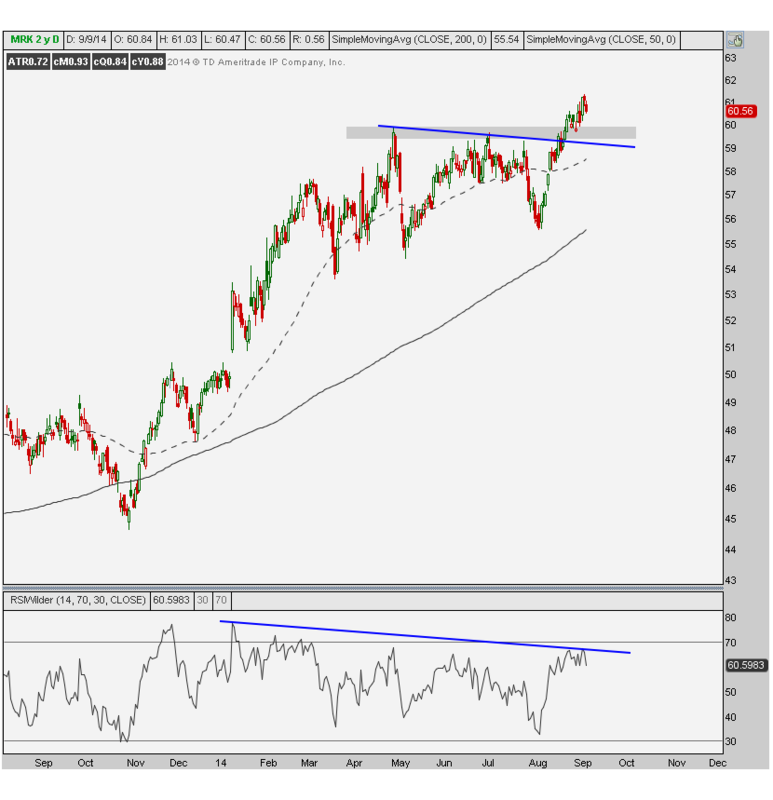 Here is a $XLV relative to the S&P500 breaking an uptrend line from the past few months and momentum also putting in a bearish divergence. 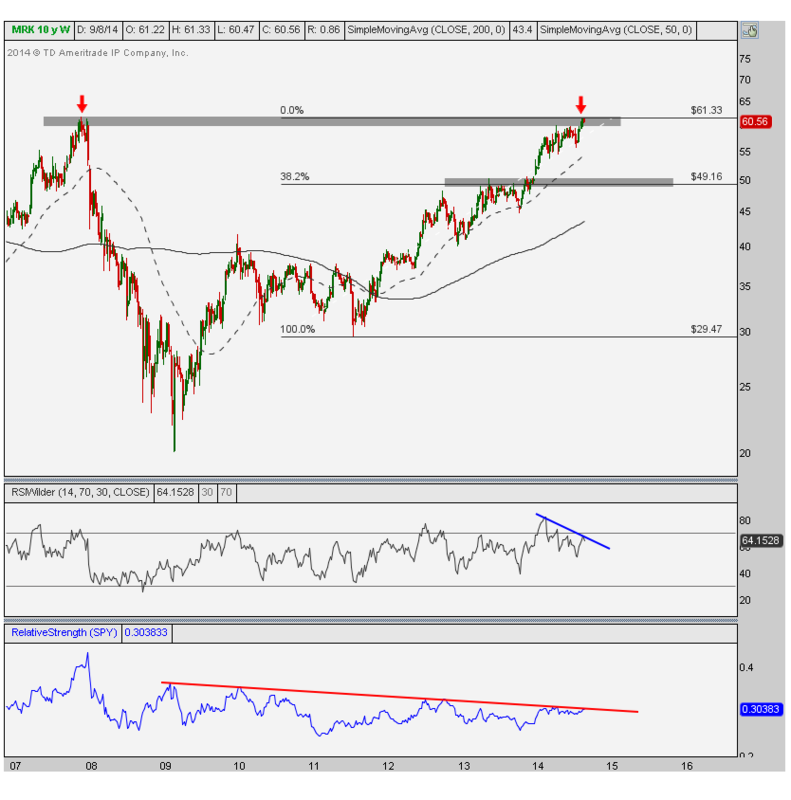 It’s the combination of bearish momentum divergences on multiple timesframes and relative strength that really catches my attention (also see: Is Apple About to Crash September 2012). I don’t know what is going to happen in healthcare. No one does. I don’t claim to know something that others don’t. 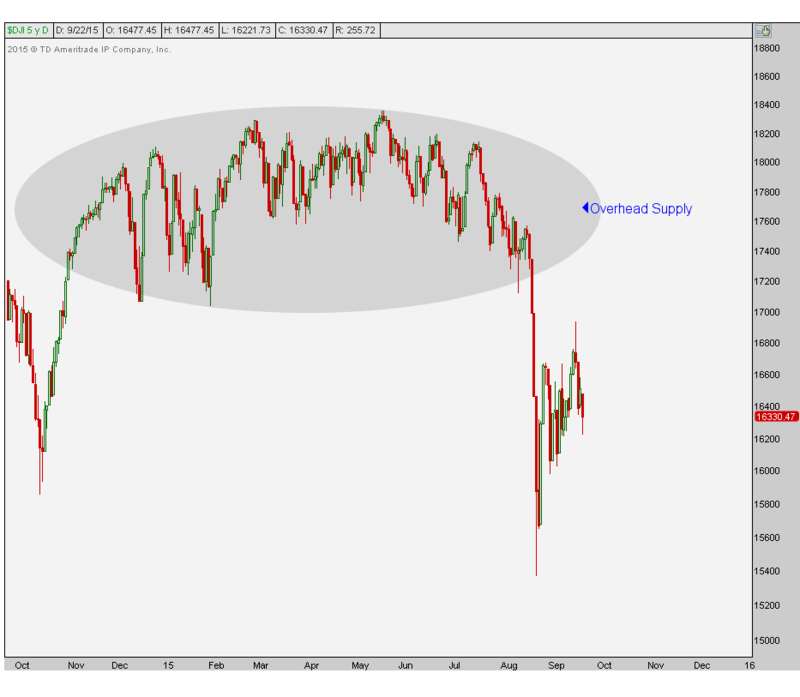 I’m simply asking the question: Is this the beginning of a severe correction for America’s most loved sector? You tell me. The weight of the evidence suggests to me that a short entry could be here. 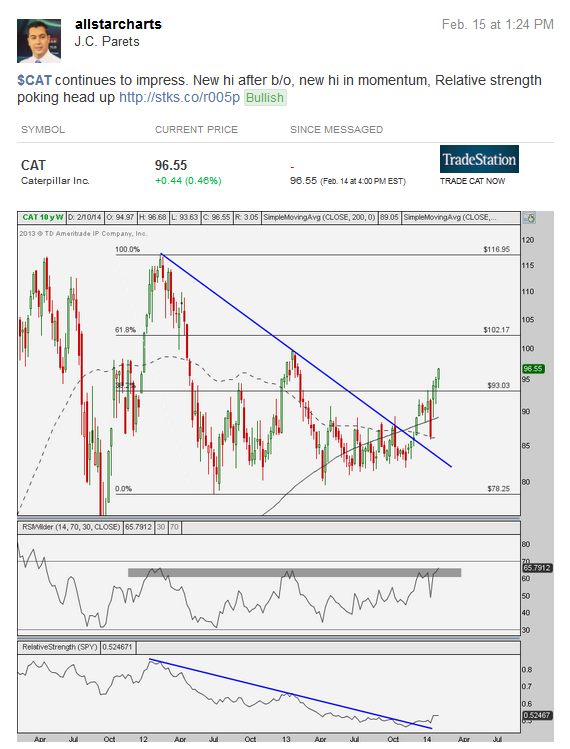 Our upside target in March was just over $75. I don’t see any reason to be short if prices are above that level. This makes the risk/reward very much skewed in favor of the bears and the risk is well-defined. To me, that’s what matters most. 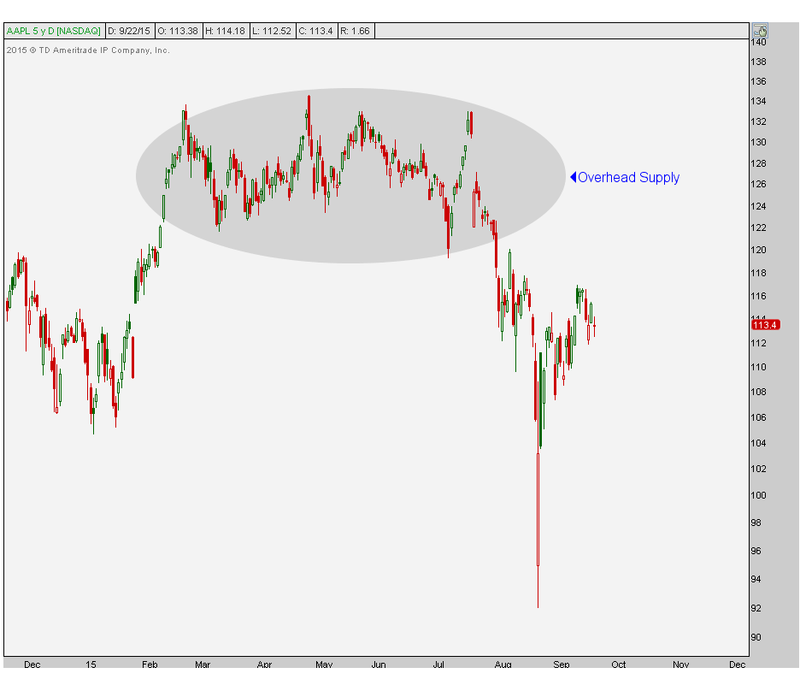 Price target-wise, where do I think we’re headed? 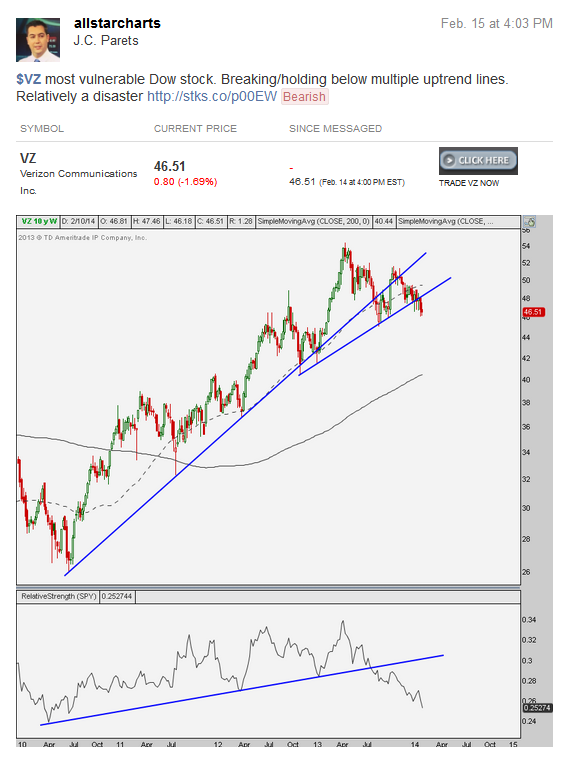 $62-$64 in $XLV looks like a good area to take profits on shorts. This is the level where we broke out from in late October before healthcare made it’s (potentially) final run. This area is also where several Fibonacci levels cluster together, particularly the 261.8% extension of the entire 2007-2009 correction and the 38.2% retracement of the 2012-2015 rally. To me it’s where support/resistance levels and Fibonacci all come together. I would be covering shorts down there. This represents 14-18% lower from current prices. I’m throwing ideas out there that I think make sense. That’s all this is. Some of the top holdings in the Healthcare space $JNJ $GILD $PFE $MRK are all showing similar characteristics. So I don’t believe that this is out of left field. What do you guys think? 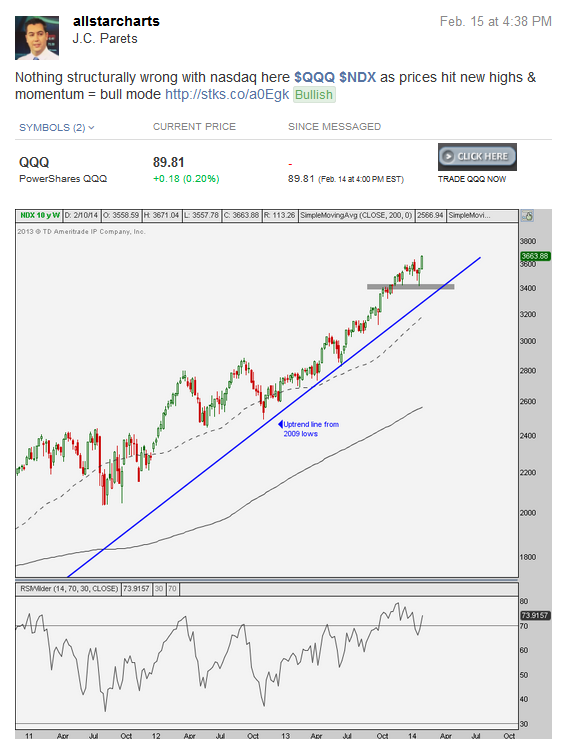 Click Here to receive weekly updates on each of these charts along with 30 other sectors and sub-sectors across the S&P500 including Energy, Financials, Gold Miners, Materials and Technology. 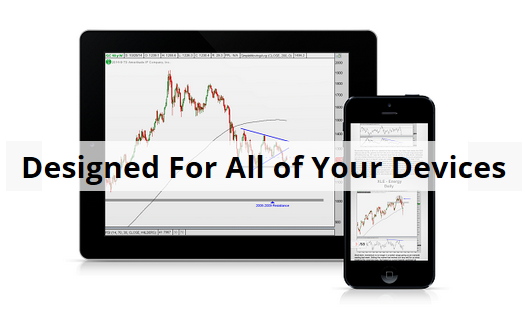 I’m happy to announce that today we sent out our first Dow 30 package to all of our new paying subscribers. This is a really excited time for us as we slowly roll out each package to everyone who has been asking for it over the past few years. I wanted to put together a quick post about it so you guys can get a better idea as to what this product looks like. 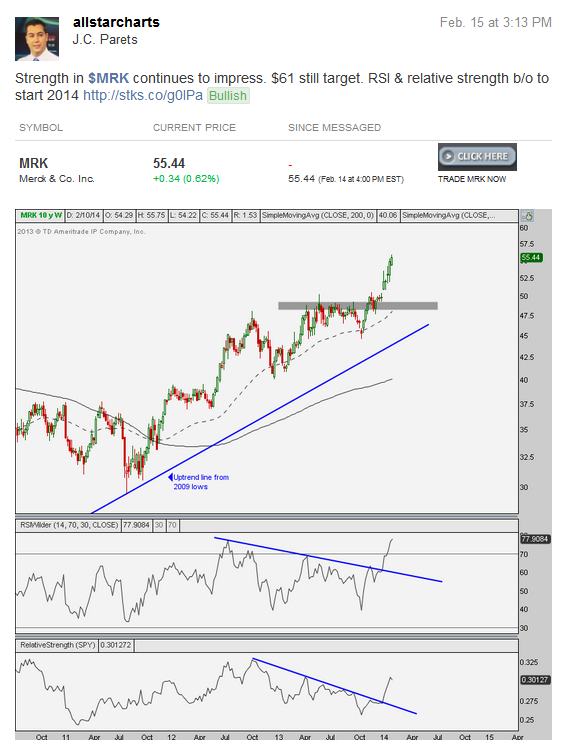 I think Merck $MRK is a good example of just how important it is to incorporate multiple timeframes in your analysis. The package is simple. 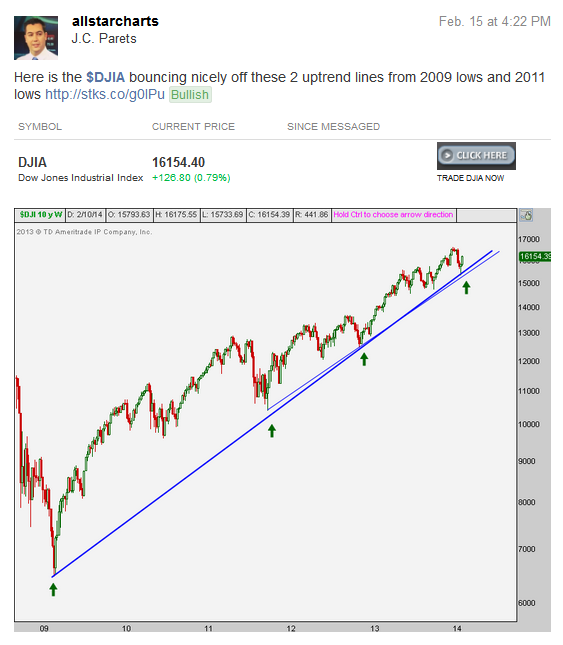 I send each subscriber annotated charts and commentary on each of the 30 components of the Dow Jones Industrial Average. For each of the 30 stocks you will receive a weekly chart for a more structural perspective with Relative Strength analysis, Momentum readings, multiple smoothing mechanisms, trend recognition, Fibonacci retracements and extensions, key support and resistance levels as well as any other commentary relevant to that particular name. 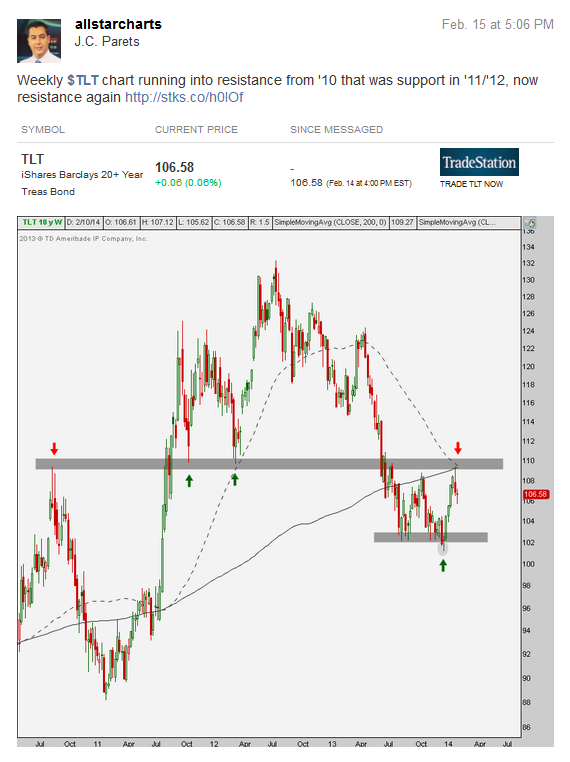 In addition, subscribers receive daily charts for a more short-term view that includes Momentum analysis, Monthly, Quarterly and Yearly Correlation Coefficients, Average True Range, Fibonacci projections as well as shorter-term moving averages. To me it’s the combination of both time frames that really adds the most value. 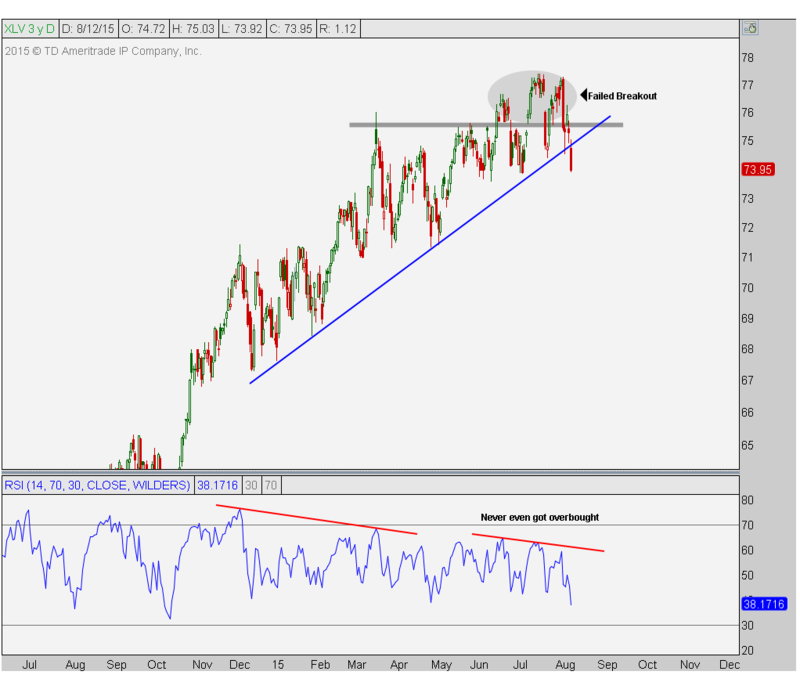 Short-term MRK doesn’t look to bad as it breaks out to new highs and momentum remains in bull mode. But based on the weekly chart, it’s a tough buy right here. We always revert to the larger time frame when looking through charts (Refer to the weekly chart for risk management procedures on short positions). A break below this shaded area can be the signal to short MRK from a short-term perspective, although the larger time frame already suggests being short. Near-term target is the August lows but the 200 day moving average is still rising. This makes it a tougher short over the near term. I think this is a good example of the value of multiple timeframes because the daily chart looks fine and very healthy. But the weekly chart is scary as we run into historic resistance. Due to the weekly chart, it’s tough to get long a name that looks so good on the daily chart. This is just another one of the ways that we try and manage risk, by looking one time frame higher. My favorite is when they both agree with one another, whether long or short. 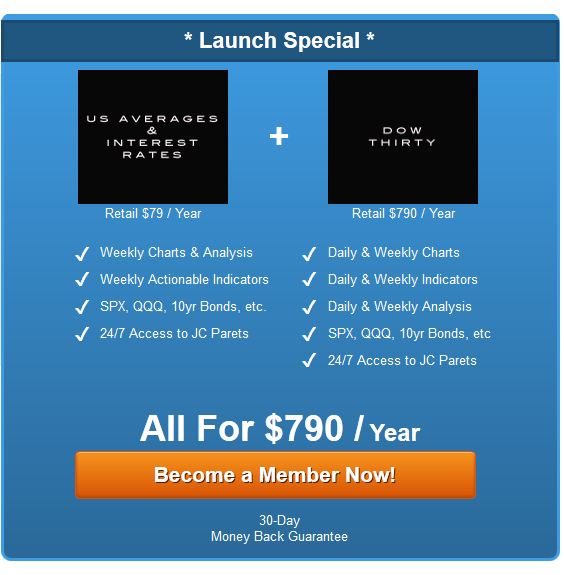 We currently have several of those in the Dow 30 package that subscribers received this week. 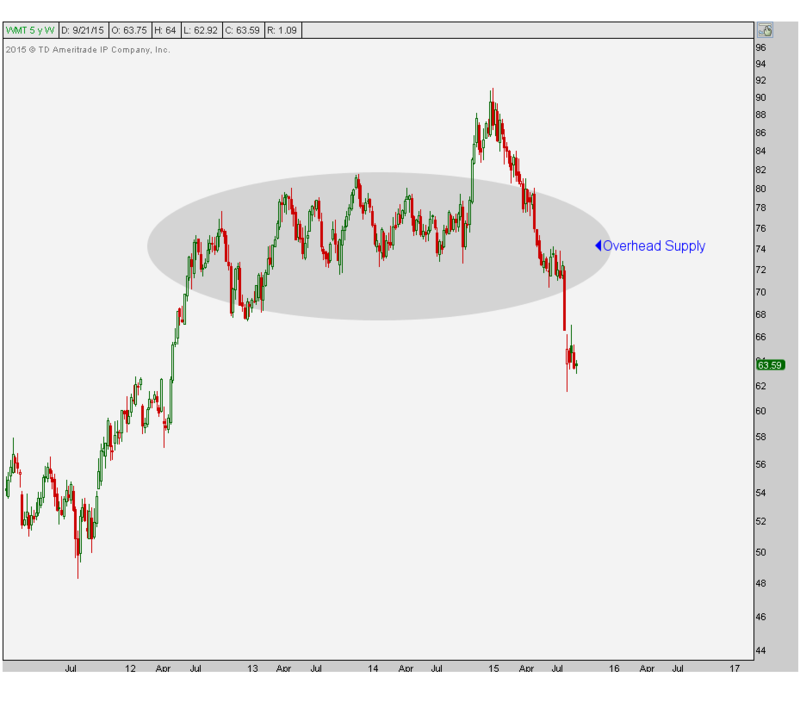 While I rip through all of my charts, I make my annotations and save everything to a hard drive so I can always reference them in the future. This way I can see what I got right, what I got wrong, and more importantly why. I’ve been doing this my entire career as a technician. 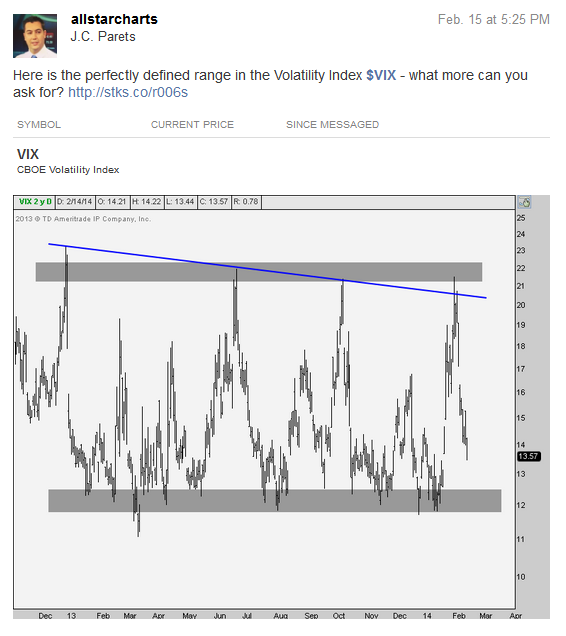 Anyway, along the way I shared what I thought were some of the more interesting charts on Stocktwits. Here is a copy of my stream. 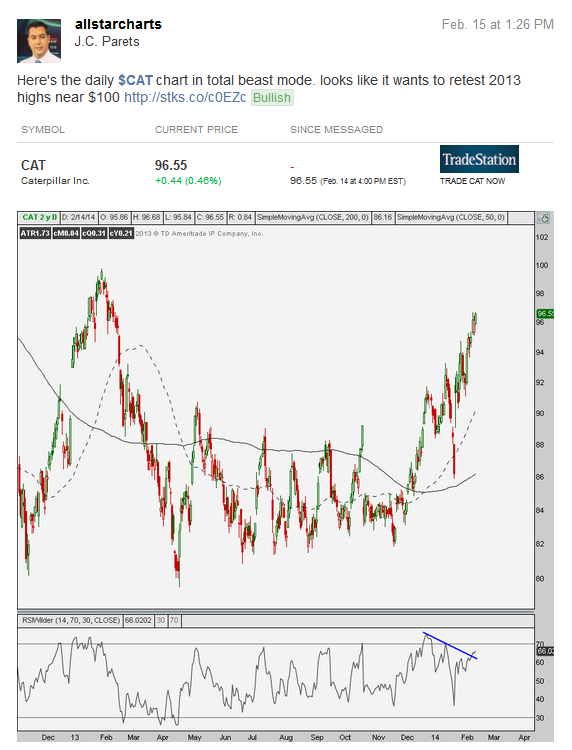 REGISTER HERE if you’re interested in receiving information about how to access all of these charts and many more on a weekly basis. 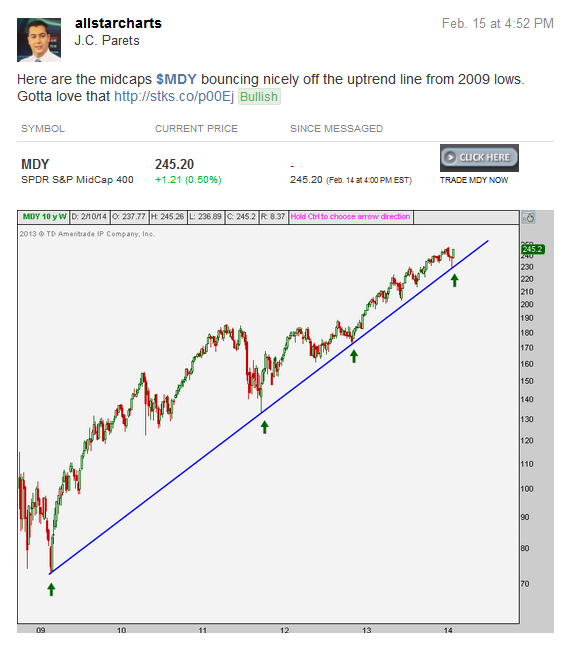 Is the S&P500 ‘Dead Money’ for Now? Technician Carter Worth of Oppenheimer is out this week calling the S&P500 “Dead Money, at best”. 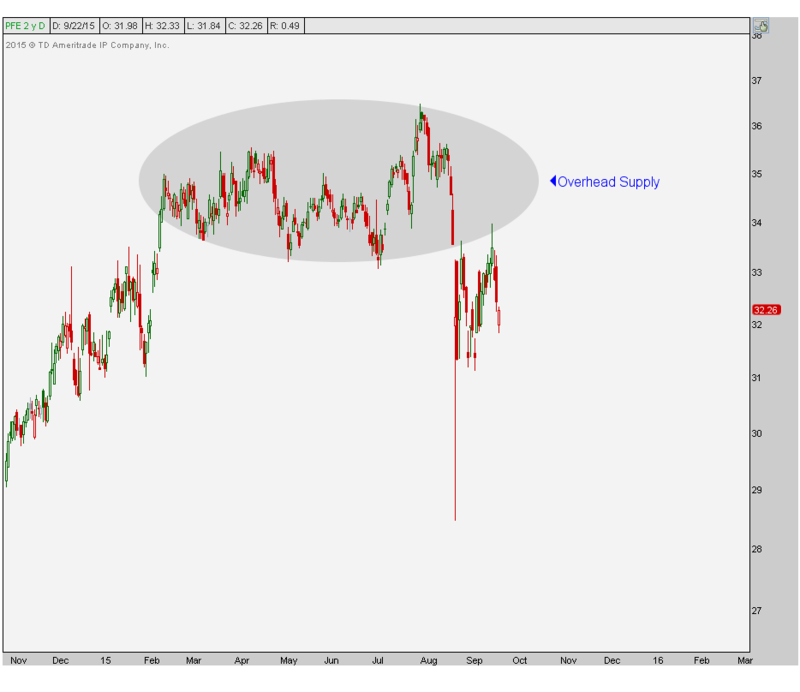 I thought this was an interesting take on a large cap index comprised of 500 American companies. Remember, this is a cap-weighted index, making the largest companies more important than the others. As opposed to the Dow Jones Industrial Average that doesn’t care how big your market cap is, just the price of your stock. “The thesis is a continuation of a view that began in late November. Worth reasons that the S&P 500, at best, is likely to remain stuck at the 1,400 – 1,430 level for weeks and might head back down to 1,350. ‘The primary issue we have with the market is the large and growing number of ‘Bullish-to-Bearish’ Reversals found among important super cap stock composing the S&P 500,’ said Worth. Worth reviewed the chart patterns of a dozen of marquee names and points out that all have taken on ‘rollover casts’ with their respective smoothing mechanisms flattening or already sloping down. 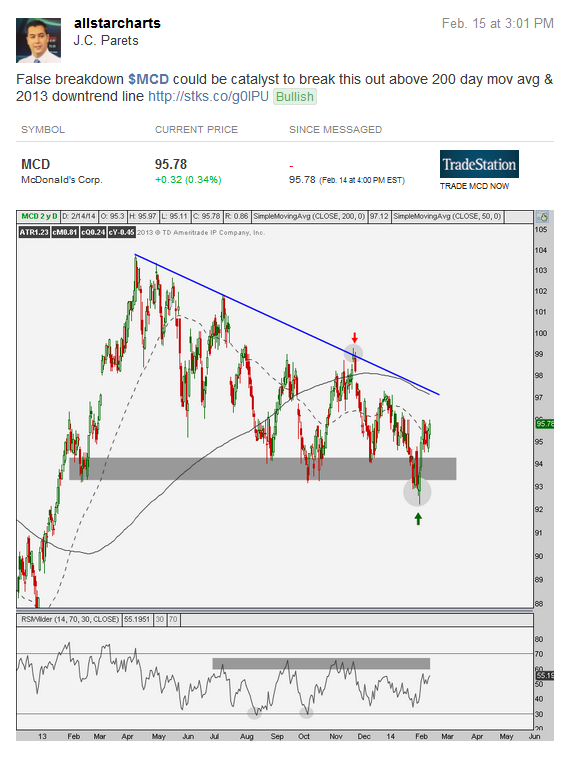 His analysis includes stocks like Coca-Cola ($KO), IBM ($IBM), Apple ($AAPL), AT&T ($T), Philip Morris ($PM), PepsiCo ($PEP), Merck ($MRK), Colgate ($CL), Microsoft ($MSFT), Mondelez ($MDLX), Target ($TGT), Wal-Mart ($WMT), and Verizon ($VZ). He makes some valid points. But rather than taking this as a negative, I think we should maybe feel somewhat fortunate in that this is becoming more and more of a stock pickers market with each passing day. Remember 18 months ago? Very different. Remember 3-4 years ago, the Risk-on/Risk-off hysteria? Straight silly. So some of these humongous companies may not look so good. Big deal. Some of the others do. And some smaller ones that aren’t even in the S&P500 look great. And some of the little guys look like garbage. How much more fun is this? In case you missed the first part of the interview, I had honor last week of chatting with one of the most legendary Technical Analysts that you’ll ever meet. 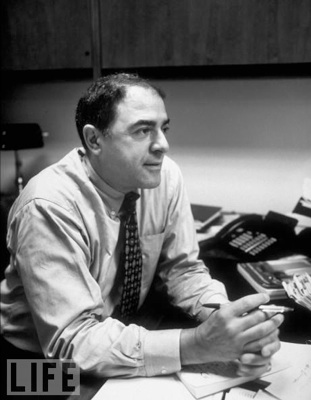 Ralph Acampora is a pioneer that helped open doors for the next generation of technicians like myself. I’m not really sure where technicians as a group would be today without guys like him. And for that we are grateful. In part 2 of the series, Ralph shares his thoughts on today’s stock market, bonds, commodities, and a little bit about how the Market Technicians Association first got started. JC – Okay let’s get into it Ralph: We’re sitting right near all time highs in the S&P 500 the Dow Jones Industrial average. We’re essentially at the highest levels that we’ve ever seen ever but you turn on the TV and you read the news and it’s just brutal. This is the most hated rally I know I’ve ever seen. Do you want to talk a little bit about how you’re feeling? Ralph – I’m glad you started that way because I wanted to start that way, exactly like that, and I’m not just saying that because you started it that way. I’ll rephrase what you just said, because you had that little lift in your voice which is true because these are all time highs. Said another way, these stocks and these indices have never been this high in their entire history. You know I did a little survey; remember I told you that I like Papa Dow? Listen to this, there are four Dow stocks currently at all time new highs: Chevron, Travelers, Wal-Mart, and Disney. That’s 13% of the Dow. Here, I’m going to give you a list of another 8 stocks in the Dow that are within 10% of all time new highs: Triple M, American Express, Coca Cola, Exxon Mobil, IBM, Johnson and Johnson, McDonalds, and Procter and Gamble. 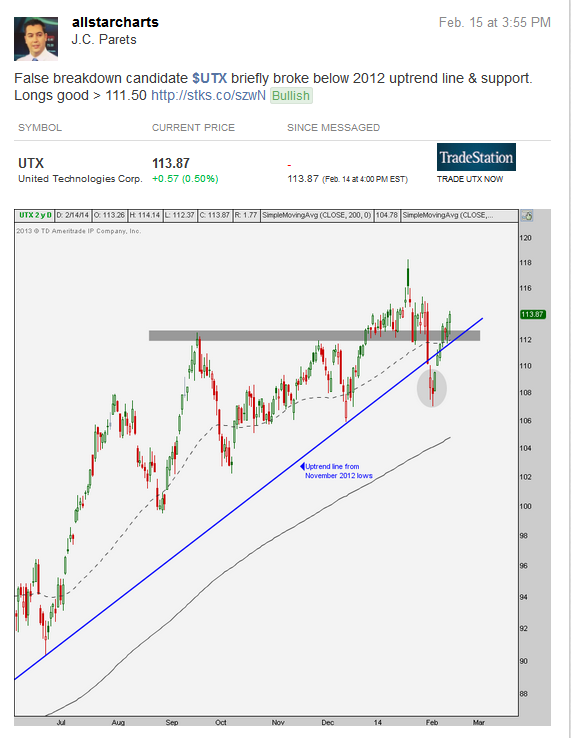 And then I have another three that I think will make all time new highs at some point; Home Depot, United Health, and United Technologies. That’s 50% of the Dow stocks, as I interpret it, are either at the door step or are about to make all time new highs, that’s half of the Dow. Then go back to 2007, the last time we were up at this level. Just stop for a second and ask yourself; what was the feeling around the street? What were the public’s thoughts? #1 the public was fully invested in the market. The street was bullish the last time we were up at this level. It was exciting. Now, the public is in bonds or cash. They’re not buying. In fact we lost a generation. The only people you have today are some portfolio managers and hedge funds and they’re not doing very well, the average hedge fund is up like 3.5% for the year, they’re not doing well. And listening to the commentary on TV every time you turn around they’re talking about Greece, India, or China and everything else. I have to add to your question. Now that we’re at all time highs, the next question is how many times does the market discount negative news? And the answer to that is ONE. So all that we’re getting is regurgitated news. How many times do I have to hear about Greece? Come on, give me a break. And another thing, they talk about how China is going to have a hard landing. Go back and see when the Chinese market peaked. The Chinese market peaked in August of 2009 and it’s been going down ever since. At that time the Dow Jones Industrial Average was selling at 9600 so the Dow has been going up for the last couple of years and china is going down. So as far as that’s concerned, all of this news out there, I wouldn’t say it’s totally baked into the pie, that would be naive, but most of it is. I’m not saying that US is the best place in the world to be invested, but it is. The next one right be behind us is the bellwether of Europe, the DAX, Germany. The DAX is 1% away from making all time new highs and no one is talking about that. That to me is the most bullish thing I’ve ever heard in my life. The classic bull market JC, does fear and blue chip. That’s exactly what we have. I think we’re in a secular bull market. JC – Can you compare what we’re in right now to anything in the past? JC – That’s great stuff. So we talk a lot about cyclical markets and secular markets and how long they typically last. The consensus out there seems to be that secular bear markets typically last longer than the 12 years that we’ve been in. So you don’t think that’s right? You think that we’re already in the next secular bull? Ralph – We had 12 years, what do you want another five? 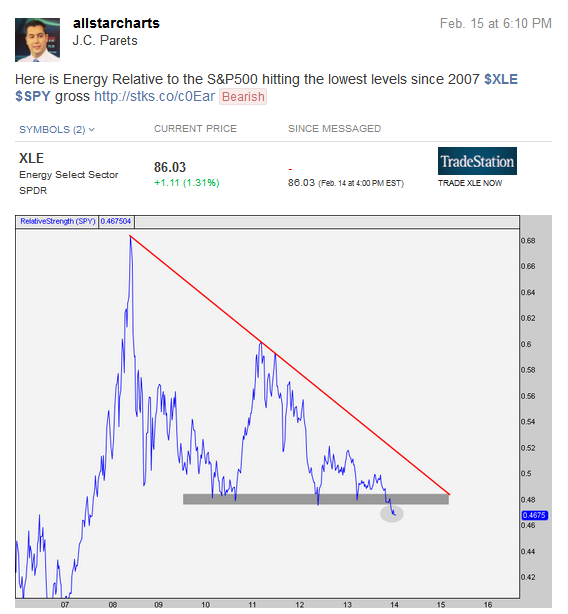 JC – The generational bottom huh? JC – That’s great Ralph. 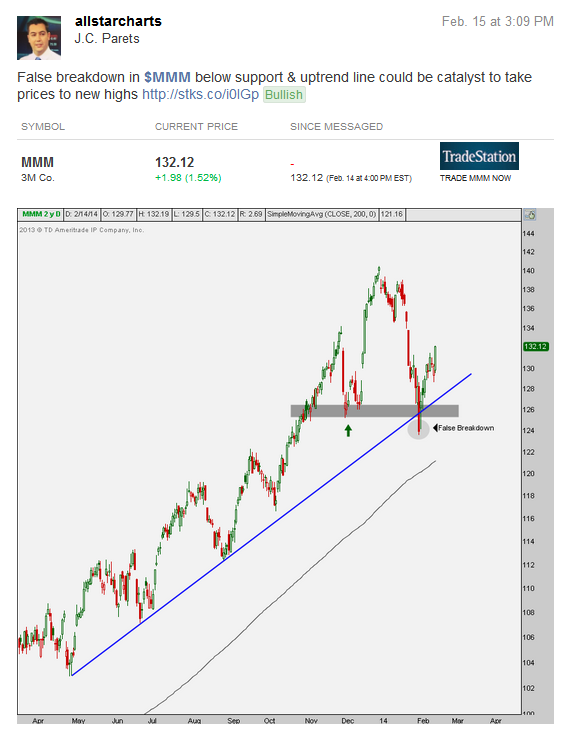 So you mentioned Murphy earlier and intermarket analysis. I’m a huge intermarket guy so obviously I enjoy and value the information that we get from bonds, commodities, and other currency crosses. How do you incorporate that stuff into your analysis? What is the current intermarket landscape telling you and does it agree with what you’re talking about in equities? Ralph – Yeah well first it would be bonds. I think they’re over owned. I’m not saying they’re topping out today. But the odds are they’re closer to making a major top than they are to making a major bottom. I think at some point in time, and I hate to say it but it’s true, I think the public is in the wrong place. The higher the equity market goes when we start trading at all-time new highs….there’s nothing like rising stock prices to bring money back into the stock market. And I think that’s what we’re going to start seeing, that shift away from bonds into equities. That will be a tsunami of money, talk about cash on the side lines. Whether it’s sovereign wealth funds, I deal with many of them in the mid east with our company. I got to tell you, they’re in gems, they’re in gold, and cash. To get them to buy equities is like trying to break their arm. They’re not there. I think we’re going to see a major shift from fixed income specifically. 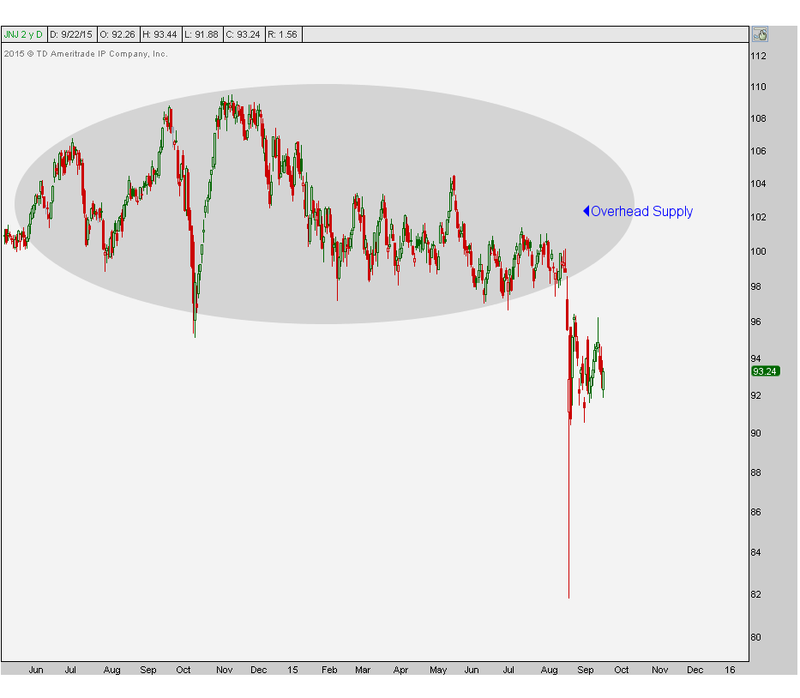 JC – So you briefly mentioned precious metals? What are you thinking there as the fiat currencies around the world are being diluted and money has been flowing in that direction. Do you think that’s going to continue? Ralph – I’m not in the camp that gold goes to $5,000/oz. But I think you can easily make all-time highs in Gold. I don’t think there’s any problem with that. But when I say that, people say, “well if you like gold you can’t like equities”. That’s not true, go overlay a gold chart on top of the Dow; you’ll see there are quite a few periods of time where they both go up at the same time. The last couple of year’s equities are up 100%+ and gold is gone up dramatically. Yeah. So I think gold and silver as a currency should definitely be a portion of ones portfolio. JC – This is something that’s personal to me. One of my favorite long term charts out there has been the Dow Jones industrial Average relative to gold. The Dow/gold chart. I know you love your Papa Dow, so when you talk about that ratio, in the early 80s gold and the Dow were at the same price (1:1 ratio) and over the next 20 years that ratio got up to 44 to 1. Ever since 2000 that ratio has been declining 30 to 1, 20 to 1, 10 to 1, and in August last year we went under 6 to 1. You want to talk about trends? That seems to be a pretty strong ongoing trend. How do you feel about that? JC – No, I’m just talking about that particular ratio. Do you see any validity to it? How do you feel about that trend? Do you just ignore it? Ralph – Sure, gold on a relative basis has beaten the heck out of equities. But I’m an equity guy. 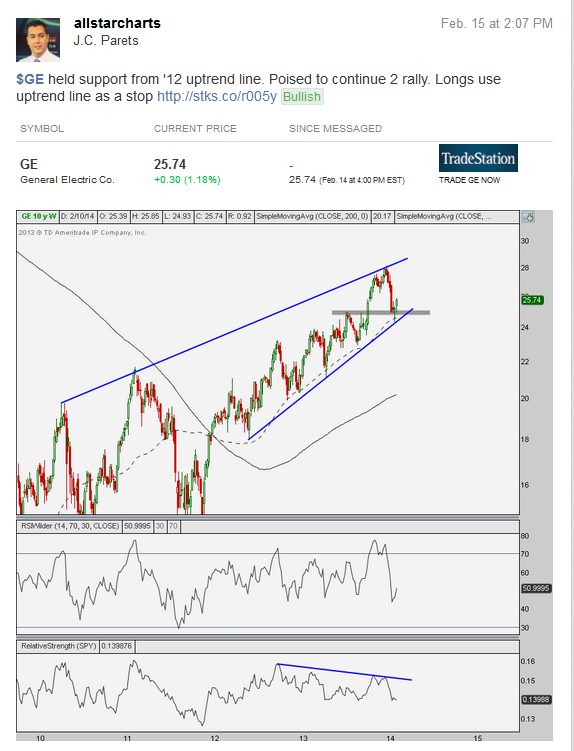 I’d like to own some Wall-Mart, go look at Pfizer and Merck, go look at GE on a monthly chart. 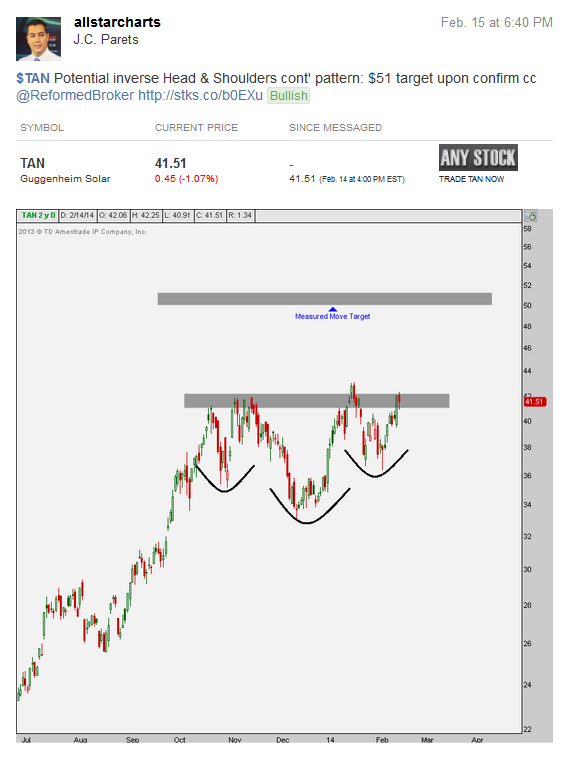 These are awesome stocks. Look at the Dow by the way. 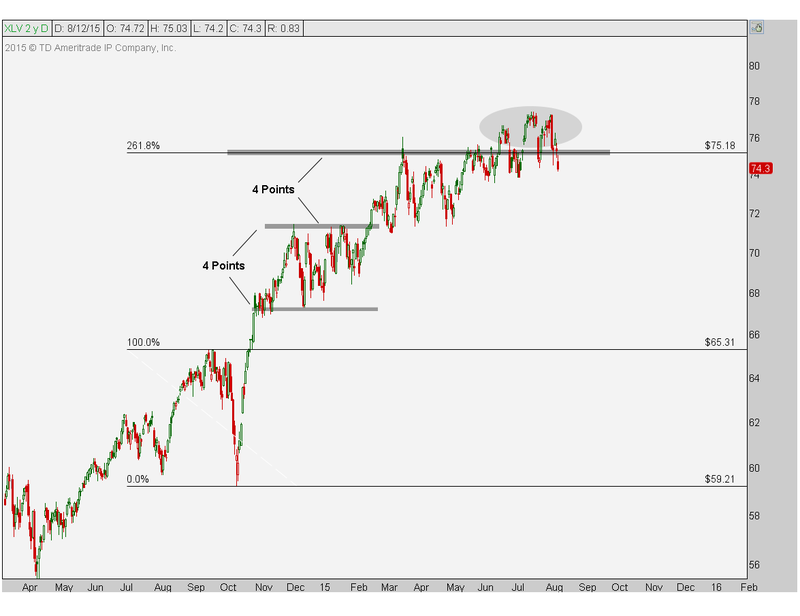 JC – Okay equities. They’ve been trending higher for three and half years, everything looks great, all time highs, this and that. But something that hasn’t been trending and goes through spurts and some sideways periods is crude oil. Do you think that as equities continue to rise and in theory economies improve, there will be more demand for oil? 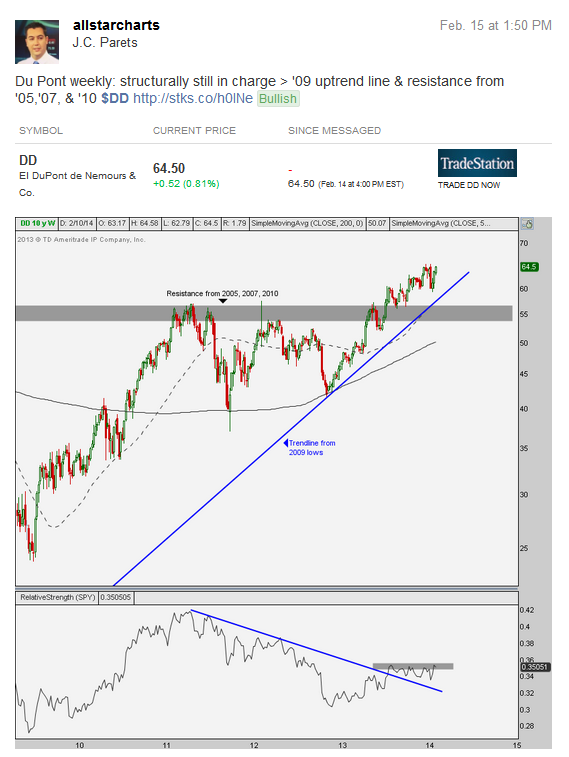 Will oil prices continues to rise with equities? 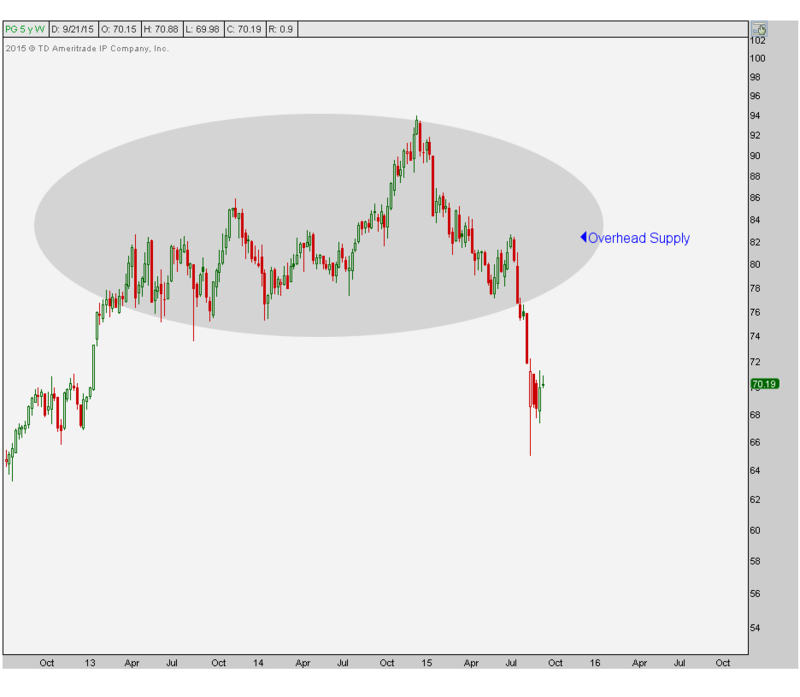 Ralph – Yes I think oil will rise. Oil has a problem because it’s a political football. It’s the signature in Iran and Israel and every time you turn around they jerk that thing around. 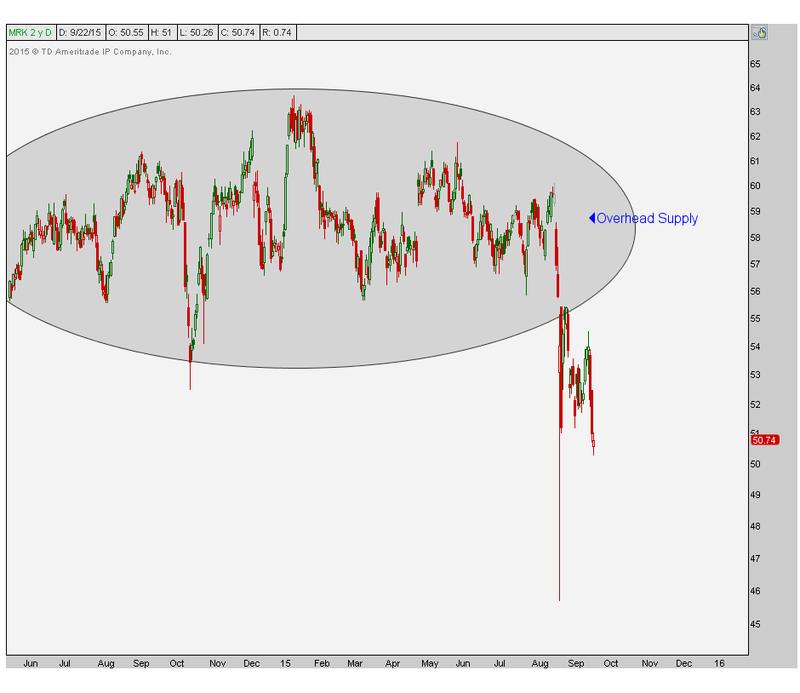 I think technicals are very important in looking at crude. But to say I would rather be in crude over equities? No way. JC – Alright. Getting back to something that I know is a little bit more near and dear to your heart is the Market Technician’s Association. Do you want to tell the readers a little bit about how it started? Ralph – Sure, it’s wonderful. First of all the MTA next year is going to celebrate its 40th anniversary – it’s going to be in April. So you have to come to that. We’re going to have everyone there. All the old timers, we’re going to have Tom DeMark, and hopefully Andy Lo, the professor up at MIT and everyone that has worked so hard to raise the respect for technical analysis. It started actually 43 years ago with two guys. One from the Bronx and one from Brooklyn. I was from the Bronx and a young fellow by the name of John Brooks, unfortunately Johnny passed away a few years ago. Both of us were frustrated because we as junior technical analysts we were not considered part of the community of analysts in lower Manhattan, Wall Street. We would go to New York Society of Security Analysts, and to say we were in the back of bus…I don’t even think we were on the bus. We had absolutely no respected whatsoever. One day we looked at each other and said, “Why the heck don’t we get some analysts, and like-minded people together just to sit around talk?” That was the beginning of the MTA. JC – And this was what year exactly? Ralph – 1969-1970. The reason why the MTA is celebrating they’re 40th anniversary is because that’s when they were incorporated. It took a few years to get to that point. It was the desire just to sit down with professionals. Mr. Rotnem, we went to him and said, “Mr. Rotnem we’d like to create this organization”. He said “Young man, you can do it and you’ll get my blessing and support under one condition, only professional market letter writers from the sell side of the street are allowed to be members”. They wanted so badly to get the best that we could have. We had 18 original members. There were originally 18 of us that could say they sat down and wrote a market letter everyday for a brokerage firm. That’s how it started. As time went by, for example, John Murphy, wants to join the MTA. He didn’t write a market letter at that time. Well we said alright let him in. I have a friend of mine on the floor of the NYSE, Ralph Fogel. He was a specialist and a former student of mine and he would use technical analysis in his trading everyday but he didn’t write a market letter. So we had to change the constitution of the MTA. It kept changing and changing and growing as the organization and membership was growing. It’s a beautiful story. And one day at the New York Institute of Finance where I was teaching in 1975, they were moving from their address on Wall Street to 70 Pine Street. I said, “Can you give us a little space for a library?”. And they did. It was a little library with a phone in it. That was the first address the MTA had. The most exciting thing that’s happened to the MTA was when the Sarbanes-Oxley law came out in 2004 and it said that all analysts on Wall Street are mandated to take two exams: series 86 and 87. The 87 was rules and regulation, fine everyone should take that. But 86 demanded that you had to have levels 1 and 2 of the CFA (to receive exemption). Well I stood up and I said to the MTA, “Take all the money in your treasury and throw it at this, we have to fight this because if we don’t win this battle we don’t deserve to be a professional organization speaking for our members”. So myself and handful of guys, one in particular David Krell, a wonderful person a past president of the MTA, David knew the bureaucracy and I knew the technical thought of the MTA, we went to the NYSE. We pleaded our case in early 2004, and in march of 2005, about a year later, the SEC changed the rule. Rule344 had been amended thanks to the MTA, So officially there are two analysts on Wall Street now. The first analyst is a fundamentalist, who follows companies and has a CFA. The second analyst is a technician who follows stocks and has a CMT. So we elevated, the MTA has elevated, the respectability of our craft and our profession to the level of the CFA. And for that I am so so proud. We’ll continue our conversation with Ralph Acampora later this week. In the third, and last part of the series, Ralph takes questions from the Stocktwits community. In case you missed Part 1 of the interview, you can catch up here. As a reminder, Ralph is teaching a one day Technical Analysis course in New York City on November 14th. To learn more, visit http://www.nyif.com/ralphisback.html.